INCREDIBLE photos give a rare look into the life of the "world's most endangered tribe" who still hunt with bows and arrows to survive in their shrinking rainforest. There are only around 80 of the nomadic Awá, one of the last "uncontacted" tribes of the Amazon, in a reserve in the Maranhão forest in Brazil. 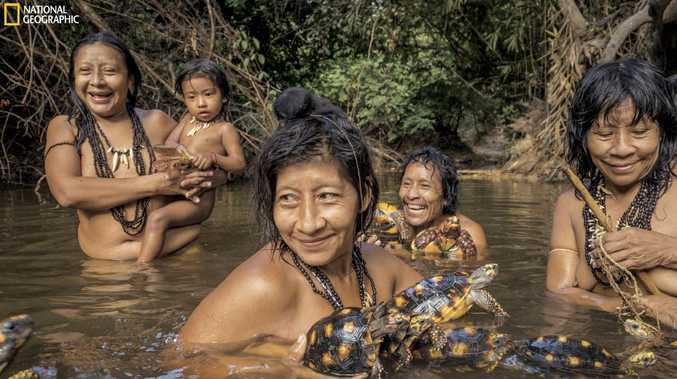 They live as they have for centuries, using traditional methods to hunt armadillos and gathering wild honey and babassu nuts in the dense landscape. The images are from the October 2018 issue of National Geographic magazine. 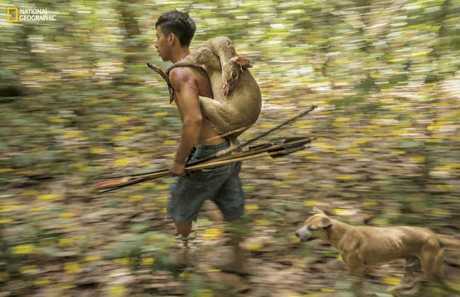 One image shows an Awá hunter with a small deer on his back while holding his bow and arrows with a hunting dog following behind. Another shows a group of women and a baby bathing in a river in the pristine rainforest. Like the forest, the Awás' very existence is threatened by illegal loggers, miners and drug traffickers invading their home. The isolated group relies on the forest and its sources of water for survival, but are forced to move almost constantly because of the threat from dangerous outsiders. They live on a reserve protected by law, but it has not stopped bandits. With 75 per cent of Maranhão's original forest cover lost, the most valuable timber left is in the protected Arariboia Indigenous Land. Timber extraction is illegal in this area, which opens the door to a criminal enterprise. Logging trucks drive through back roads unpatrolled by police and deliver their payloads to secret sawmills. 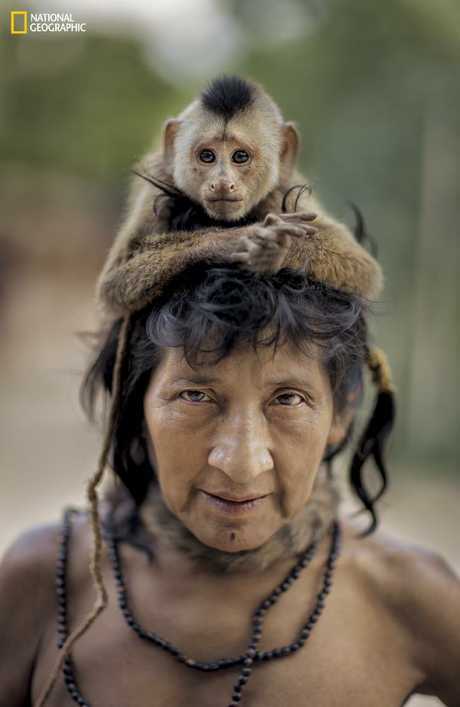 The Awá live in a state of "near-constant" flight from the chainsaws and wildfires. The Guajajara tribe also resides in the same area, and have made contact with the isolated Maranhão people over the decades. 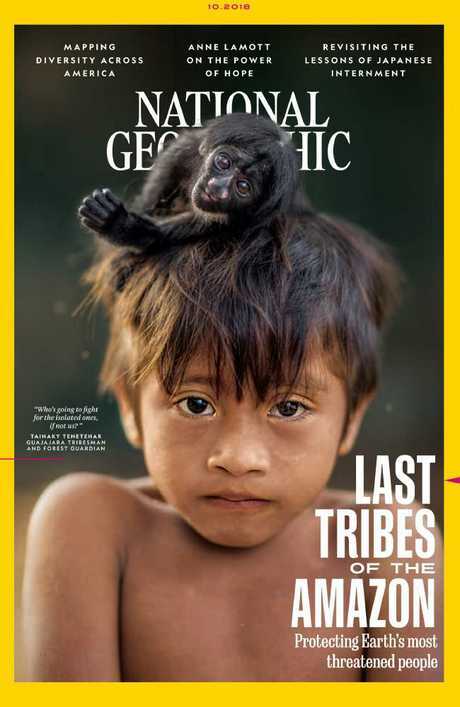 Tainaky Tenetehar, of the Guajajara tribe, told National Geographic how he and his group of "Forest Guardians" protect the "isolated ones" from fleeing. He said: "Who's going to fight for the isolated ones, if not us?" "The loggers are entering all around the perimeter of the indigenous land. "Their intention is to reach the centre - where the isolados are. They have no choice but to flee when the loggers come." The "Forest Guardians" set logging trucks on fire, seize weapons and chainsaws to keep the criminals at bay. The Awá's existence has sparked legal protection for nearly 12,500sq km of woodlands, but it has not stopped the illegal logging.